Canada built and used trailers with her military vehicles. In WWII the sizes were by hundredweight (Cwt.) which equals 112 pounds. Thus: 10 Cwt. = 1/2 Ton (jeep and small truck size). Trailer, 10 Cwt. 10-P-GS-1 Composite wood and metal construction. Made in Canada. The lunette is reversible so that it can adjusted for a high (e.g. 60 Cwt. – 3 Tonner) or low (e.g. jeep) towing vehicle to help keep it level. Photo from AEDB DESIGN RECORD. 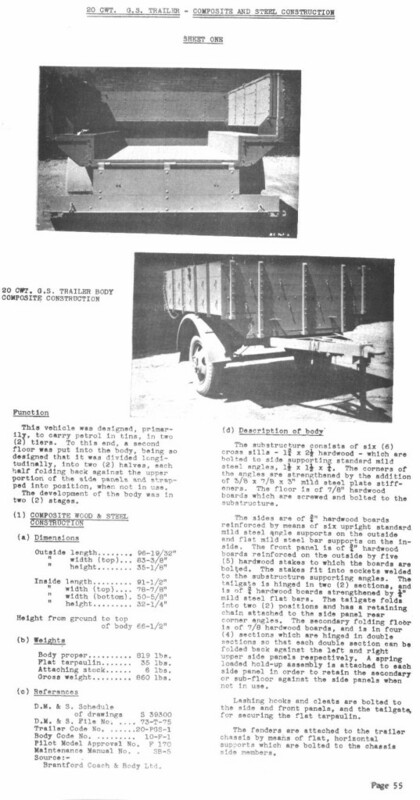 Trailer 10 Cwt, GS Code 10-P-GS as made by Willys-Overland. 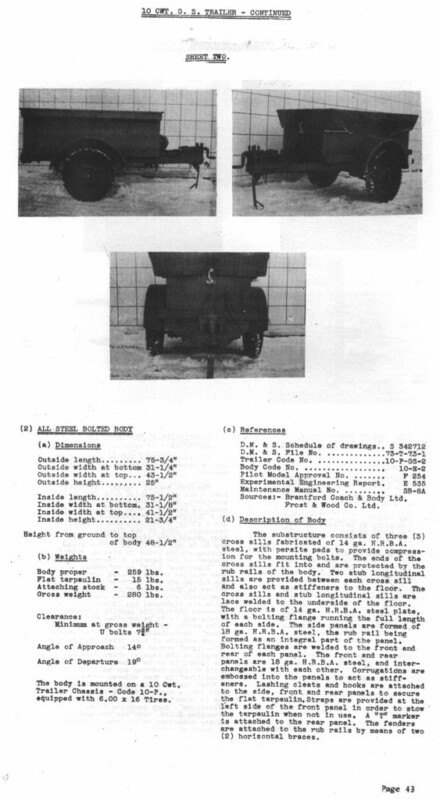 From Dr. Bill Gregg reprint of a 1944 Vehicle Data Book of the Canadian Army. 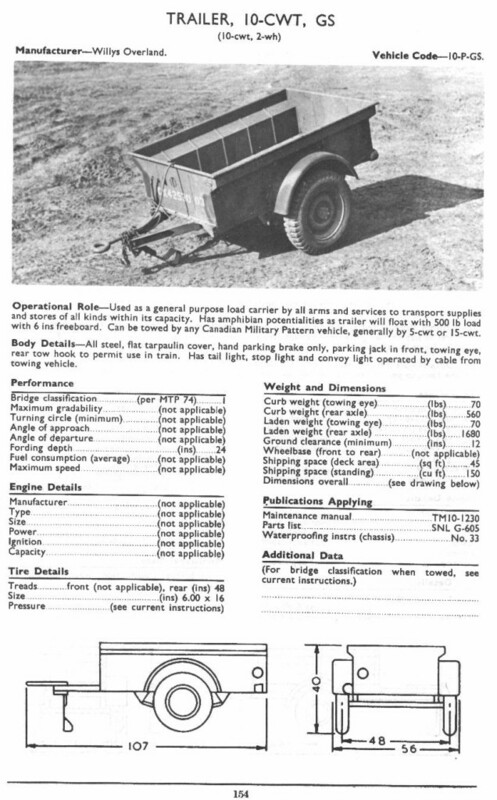 Willys MB-T trailer from reprint of a WWII US manual on the jeep and trailer. 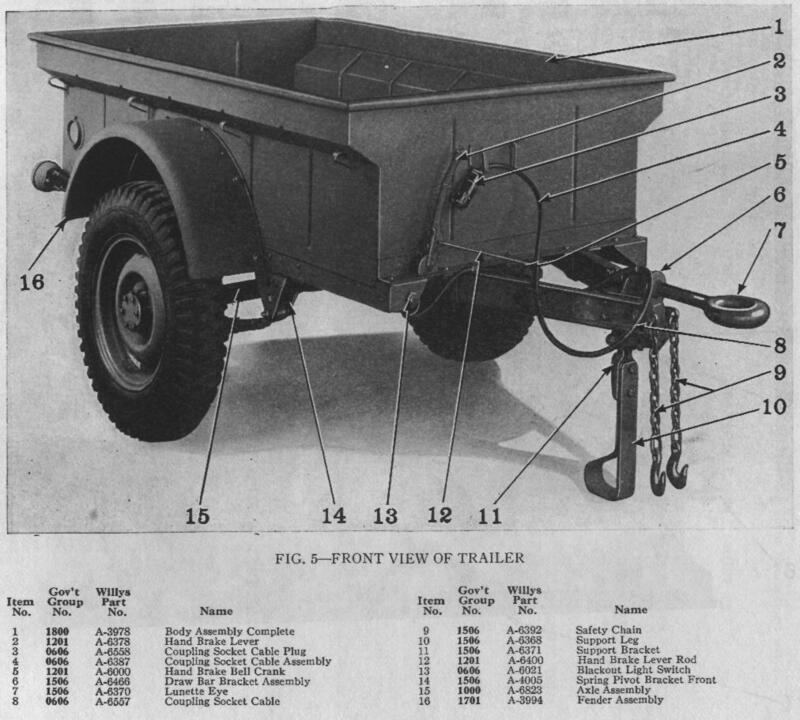 Trailer MB-T made by Willys in the USA during World War II. This is a 1/4 Ton trailer towed mainly by jeeps. It is 6 volt electrical system (M100 had 24 V); has NO corner handles (those came on later M100 trailer in 1950s); and NO tailgate (those came on Civilian T-3C trailers). Tires are 6.00×16 on “combat” (split) rims. During WWII Bantam also made virtually identical trailers. These are called the Bantam T-3 (NOTE: The T-3C is CIVILIAN post-war). These were classed as 10 Cwt by the Canadian Army in WWII. 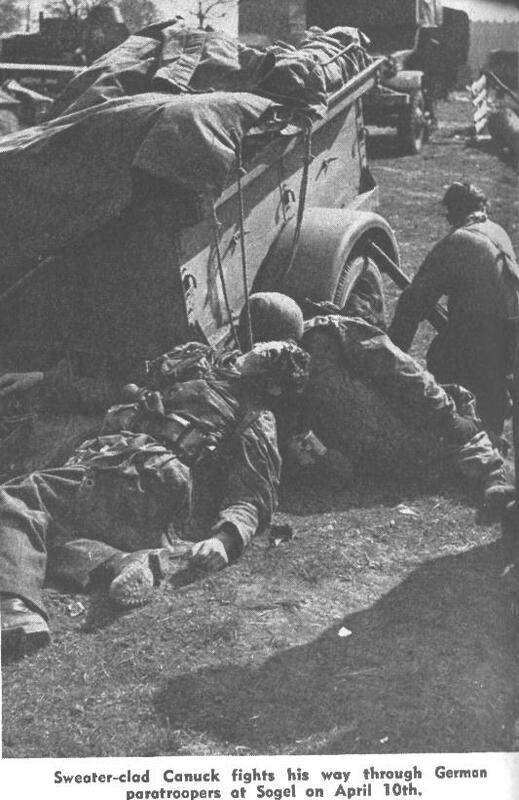 1 Canadian Parachute Battalion was part of the British 6 Airborne Division and as such used some 10 Cwt Lt. Wt. trailers e.g. for Mortar Platoon and Medical. 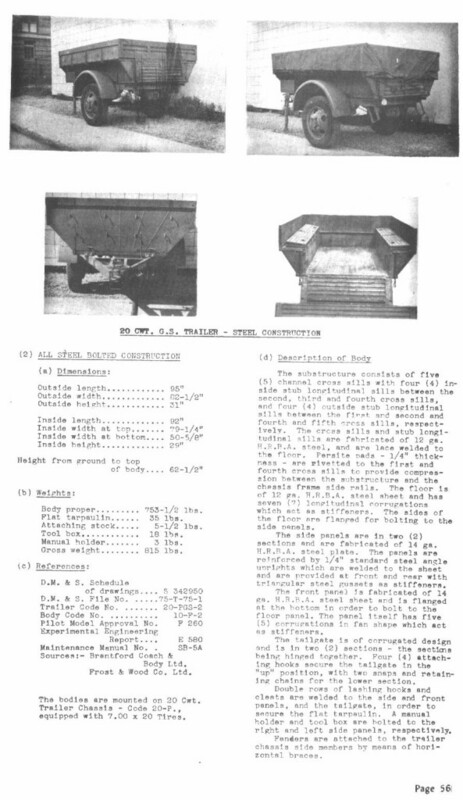 Pages 55 – 56 from Volume VII of the Canadian DESIGN RECORD (originally published by the “Army Engineering Design Branch” (AEDB) as a set of 8 volumes published in 1945. 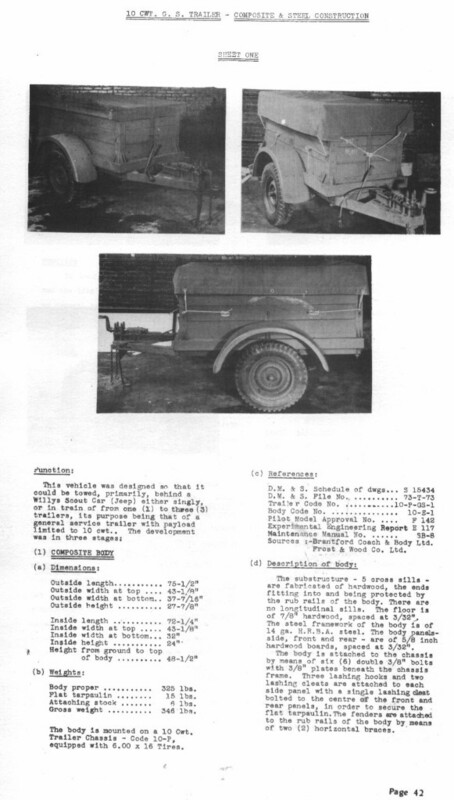 These scans are from originals of the next edition – a 2 book set published by Directorate of Vehicle Development, QMG Branch, DND. Canada used and built many other trailers. The above are just some of the most common WWII types.